A man is only as good as his word and the prepper gear he carries. Whether packing a bug-out bag or carrying something in your pocket to make essential repairs easier, no one wants to be caught unprepared, right? We’ve compiled a list of our top picks for best survival tools to get you started, plus answered a few of your questions about how to choose survival tools. Let’s take a look. Before getting into the extensive analysis and review of each individual survival tool, here’s a quick summary table of the survival tools reviewed. For most people, there are a few necessary prepper gear pieces that make a tool survival and bug-out bag worthy. Don’t just pack every single possible thing you might need. You’ll be disorganized and too weighed down to move. Here are a few things to consider when choosing the survival tools. Why in the world would you carry five tools when you could carry one? We’d rather carry one than even two, so multi-use survival tools are our first checkbox. Multi-use survival tools help keep everything organized because you aren’t digging through so much stuff to find a tool when you need it. When SHTF, you won’t have time for that. It’s particularly crucial in bug-out bags and car-cases because you don’t have the physical space to pack everything you need. Multi-use tools save space and pack down well so that you can get more stuff into your pack. The best survival tools weigh less than using separate tools, too. Ounces matter in a bug-out bag so shaving a few off the total weight makes the bag more efficient and more comfortable for preppers to carry. If you’re stuck out somewhere in an emergency, and your tool falls apart with the first use, you’re screwed. Many survival tools will last longer than that, but you still want more than a few uses before they chip, dull, or break. First, the best survival tools are dust and water resistant to avoid saturation or gumming up the parts. Next, choose durable, rust-resistant materials for metal parts, so you spend less time cleaning and repairing. Cloth materials like rip-stop nylon and durable synthetic fibers resist over-stretching under tension and experience less fiber breakage. Warranties are excellent features too if you remember that when SHTF there’ll be no one to honor it. You have to be deliberate about how you choose your survival tools. As you’re packing the bag, take a look at your inventory and ask yourself how often you may need each item. Then, ask yourself how much work goes into maintaining those items or what kind of accessories you need to keep them in working order. The best survival tools are easy. A multi-tool is probably going to come up every day, but a weapon or communication device that has a lot of moving parts and will be useless once the batteries (or ammo) runs out? That one might just stay at your house. The most important of all survival tools is your knowledge, and you should pack and prepare based on what you already know how to do. If you buy an item but have no idea how to use it, it’s junk. If you don’t know how to build a shelter, then a tarp as an essential tool, right? Pack your own bag so that it’s tailored to your specific circumstances, and more importantly, your particular knowledge set. Just about everything on the best survival tools list fits our requirements above: reliable, multi-use, and realistic. This is a good starting point but remember to add your own knowledge to the mix. If you have no idea how to use a tool, it’s useless for your survival. You can make a lot of things in the wild including a knife, but a shovel? There’s only so far you’ll get digging with your hands or a piece of stone. Instead of a multi-use knife, this is a multi-use shovel. It unscrews into smaller segments that can be stored in a pack, and each section is carbon steel and aluminum alloy. The parts include a rescue knife, fire starter, saw, bottle opener, emergency whistle, the shovel head and more. It packs into a velcro holder the same as other styles of multitools. This tiny, portable multitool is made of high-quality carbon steel and ABS scales. It has everything you expect from a multitool but in a pocket-size. The flashlight function is LED, and the movable parts are many of the classic multi-tool bits – scissors, screwdriver, and knife. It weighs less than an ounce and has a keychain attachment for secure storage. The Skeletool is a classic multitool in a foldable plier-style design. It’s ultra durable, can handle a variety of challenging tasks, but weighs around five ounces. It comes with seven tool attachments including the pliers, screwdriver with exchangeable bits, and even a bottle opener for when you aren’t running for your life. You only need one hand to flip it open unlike other multitools of this style, and the blade locks for safety. It comes with a 25-year warranty and is made in the USA. Another Leatherman classic. This is a wearable multi-tool that keeps everything you need right on your wrist. It’s customizable, and you can remove links in half an inch and one-inch sections to fit your wrist better. It can even be adapted to include an apple watch. It includes a variety of screwdrivers, hex wrenches, cutting hooks, and a few other tools. It’s TSA compliant, so you don’t have to leave everything in your checked luggage. It has Leatherman’s 25-year limited warranty and is made in the USA. Looking for more than just a single tool? The TRSCIND is a durable, well-made kit with no cheap knockoffs. It includes a knife and compass, flint stone, wire saw, flashlight, tactical pen, and a few other details that all fit in a heavy duty box. It weighs just under two pounds but is thorough enough to include an emergency blanket that can also function as a tarp or other protective piece. Many of the pieces are military grade. There’s a limited warranty for all of the original 13 parts. Wallet style tools are great for having on you at all times but taking up very little space. Not everything is a SHTF disaster. Sometimes, it’s a roadside emergency or an issue at the office. 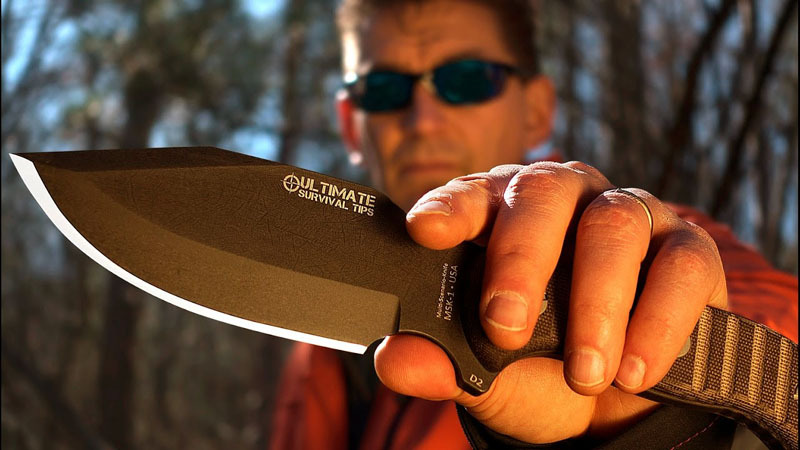 The Ninja Outdoorsman has 11 different features that all fit into a slot in your wallet. It’s bright red, so it’s easier to spot if you drop it. It’s made of stainless steel. It includes a measuring tool, wrench, bottle opener, serrated edge, butterfly screw wrench, and a few other pieces. Cordage is a vital part of a survival kit, and this one is multi-use. It includes a paracord bracelet with ten feet of cord. It has a magnetic compass face and holds a bit of flint, some necessary fishing hooks, weights, and swivels. The entire thing weighs just under two ounces. It’s adjustable for a few different wrist sizes, and it’s waterproof. The cord itself is durable, and the bracelet carries a lifetime warranty in case you use it before everything goes awry and guarantees still exist. Wit Bird’s hammer tool is an integrated wood and stainless steel design with 20 different functions. It has a hammer on one end of the head and a hatchet tool on the other with pliers in the middle. Inside the handle are saws, knives, wrenches, wire cutters, and a few other options. It’s a stylish but durable design. It measures just over six and a half inches and weighs just over 14 ounces. It’s small enough to pack in a bag, but with the hammer and hatchet functions, you’ll have a lot more flexibility than a multi-knife tool. If you need a more balanced swing, the camping hatchet multitool might be a better choice. It works a lot like our first shovel multitool in the list with handle segments that house other tools. It’s 16 inches in length, so you’ll need more space, but if you plan to use it for something different than a one-off task, it’s worth it. It’s made of steel and aluminum alloy. The segments include a fish scaler, safety hammer, whistle, and compass among other things. It has a lifetime warranty and a sheath to protect you while it’s stowed. A tactical pen is an excellent tool for any small survival kit. It fits in your pocket or glove compartment and doesn’t scream “survival tool.” It includes a refillable pen, scraper, hex wrench, and serrated edge. It even has a tungsten steel (the same material used in armor-piercing bullets) tipped glass breaker. The flashlight is LED and rated for up to 200 hours using watch style batteries. It’s TSA compliant, making it one of the only tactical pens you can carry with you on a plane. It has a stable thumb grip, and the pen component is replaceable. It’s stealthy and still usable as a regular writing instrument. We’re still obsessed with this bit of prepper gear. It’s got everything preppers need in a comfortable, wearable package that’s TSA compliant. It’s even compatible with an Apple Watch. It won’t take up any space in your bug-out bag because it’s on your wrist. It complies with all of our must haves in the buyer’s guide by being lightweight, easy to use, and multifunctional. It’s adjustable for a variety of wrists and resists rust and other types of metal wear and tear. It’s a realistic everyday carry for preppers, especially if you convert it to an apple watch band. The investment is reasonable, so your wallet won’t take a big hit. Plus, it subtly lets people know that you’re prepared for the worst regardless of the situation. What’s your must-have survival gear? Knife? Firestarter? Cordage? Let us know in the comments below.